All are welcome here. We are a friendly congregation and diverse in ethnicity, life stage, and age. Regardless of your background or beliefs we hope you will enjoy worshiping with us at King of Kings. At the heart of our church life are those times when we gather to sing, pray, hear the Word, and celebrate the sacraments. We embrace our Lutheran heritage through our worship. We share in a time of confession, reciting the Lord’s prayer, listening to Scripture, and praying together. We cherish praising God through music, blending traditional hymns with contemporary praise. We celebrate the Holy Communion every Sunday - all are welcome at the table. It is our desire to develop a family culture where everyone belongs and comes together to worship and serve our Savior and Lord, Jesus Christ. Please join us as we do God's work in Christ's name for the life of the world. We have two Sunday morning worship services each week. Both include Bible readings, prayers, passing of the peace, a sermon, and Holy Communion. All are family-friendly, though the 10am regularly offers a children’s time. This service uses a spoken liturgy and more traditional hymns. This service projects our liturgy on screens to follow along and incorporates a rotation of our vocal choir, bell choir, praise band, and other instrumentalists. We love children at King of Kings! Our goal is to equip parents, grandparents, and other adults in a child’s life to model what it looks like to be followers of Jesus in the world today. We encourage children to participate in worship and believe children “catch” the faith when they see their parents and other adults in the faith community living out their own faith through worship. We also know sometimes kids need a little something extra on Sunday mornings. With that in mind, we offer Pew Bags for children that include some quiet activities to enjoy during service. Our Kidz Korner, a professionally-staffed care room, is available for children 5 years and younger during the 9am Sunday school hour and the 10am Worship Service. Feel free to wear whatever makes you comfortable! You will find people dressed in various ways at our worship services wearing everything from skirts to jeans, and dress shoes to flip flops. You don't need to wear a suit and tie, but if you would like to you certainly can. Whatever you look like when you walk through the door, we’ll be glad you joined us! 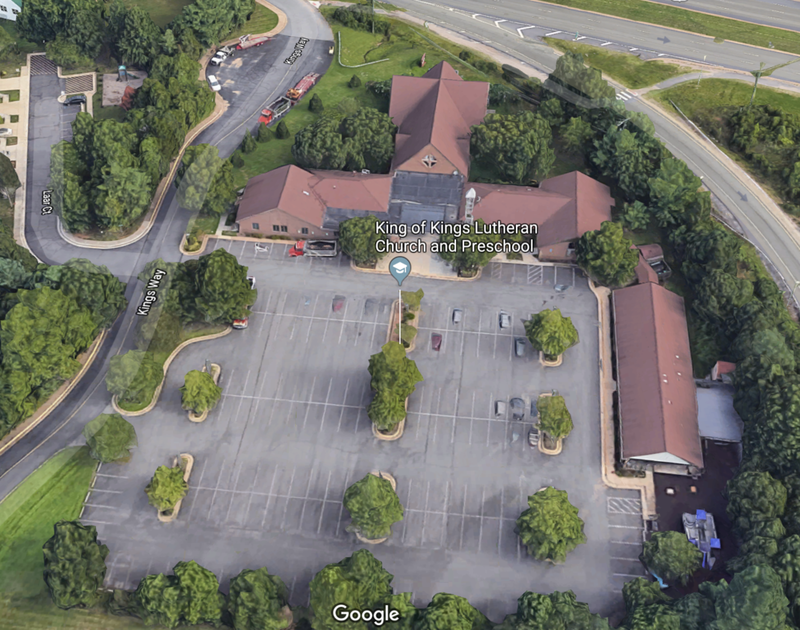 King of Kings is conveniently located in Fairfax, Virginia at 4025 Kings Way near the intersection of the Fairfax County Parkway (Route 286) and Lee Jackson Memorial Highway (Route 50). From route 50 turn onto Middle Ridge Dr. and make an immediate left on to Kings Way. Follow the bend in the road to the church. We have plenty of parking in our parking lot including handicap and guest spaces. The main entrance of the church is near our bell tower.